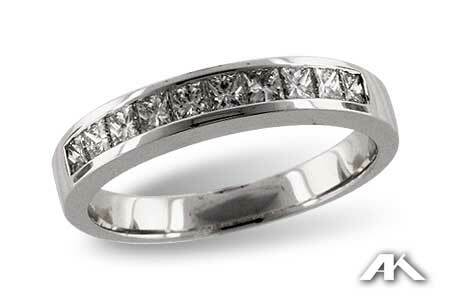 This is a popular style, princess cut diamonds in a channel set ring, this one is 14k white gold. It could go on any finger you would like? This ring is channel set with .50ct total weight in Princess Cut Diamonds. A great every day ring this style can be worn and enjoyed with any lifestyle. This ring is a special order item and not available for viewing in store. Please allow 4-6 weeks additional delivery time. Specify desired finger size when placing order. This ring is also available in 14k yellow gold, additional finger sizes, and in .25ct total weight & 1.00ct total weight sizes. Please call or email us for more information on custom orders.